Background: Immunophenotypic analysis of leukemic cells by multicolor flow cytometry using different monoclonal antibodies labeled to various flourochromes, is an important, precise and rapid investigation for diagnosis, classification, prognosis prediction, and minimal residual disease detection in acute lymphoblastic leukemia (ALL). Objectives: The aims of study were to study the expression of CD45, CD34, CD10, human leukocyte antigen-DR (HLA-DR) in B and T-ALL among 114 Iraqi patients and compare findings with other reports worldwide. Patients, Materials and Methods: A retrospective cross-sectional study was conducted on 114 ALL patients of various age groups from different hematology centers in Baghdad who were referred to Flowcytometry Department at the Bone Marrow Transplantation Center/Private Nursing Home Hospital/Medical City for immunophenotypic classification using multi-color flow cytometry from the January 1, 2016, to the August 31, 2016. Results: Out of 114 patients, 71 patients were pediatric patients and 43 were adults. Eighty-three patients were classified as B-cell ALL and 31 patients as T-cell ALL. There was significant association between male gender, high white blood cells count and T-cell ALL subtype. Negative-dim-moderate CD45, positive CD34, and positive HLA-DR expressions were significantly associated with B-cell ALL. Common ALL antigen was seen in 86.7% of the B-cell ALL patients and was accompanied cTdT expression. Aberrant myeloid antigens were observed in 22.9% of B-cell ALL patients and in 35.5% of T-cell ALL. About 4.8% of the patients with B-cell ALL had aberrant T-linage antigens while 6.5% of the patients with T-cell ALL expressed aberrant B-cell lineage antigens. Conclusion: Immunophenotypic expression of ALL cells among Iraqi patients is to somewhat in accordance with various researches worldwide making immunophenotyping flow cytometry a crucial appliance in diagnosis, classification, risk stratification, and minimal residual disease detection in ALL. Acute lymphoblastic leukemia (ALL) is a malignant disease characterized by a clonal proliferation and tissue infiltration by leukemic lymphoblasts that have exaggerated and uncontrolled growth, fail to mount a normal immune response and compete with normal hematopoietic cells.,, ALL is characterized by distinctive morphological, immunophenotypic and genetic features, some of which have important clinical implications for diagnosis and/or response to a particular treatment. Understanding pathogenesis, ALL results from progressive genetic events in a single lymphoid progenitor cell at one of several different developmental stages where T-cell or B-cell precursors may give rise to T-cell ALL or B-cell ALL, respectively., Previously, leukemia used to be diagnosed on the basis of morphology of the blasts. Although helpful, a significant number of patients were misdiagnosed and subjected to inadequate treatment, due to considerable overlap of morphological characters in myeloid and lymphoid cells. Remembering the limitation of morphology, immunophenotyping, by the means of multi-channel flow cytometry, has emerged as a standard procedure in confirming diagnosis of ALL with further subclassification and was also developed as a useful tool for the detection and monitoring of minimal residual disease. An ethical clearance from the bone marrow transplantation center at Medical City Center and approval from the patients were obtained for a retrospective cross-sectional study that was conducted over a 2-month period to study the immunophenotypic profile of 114 newly diagnosed, pretreated ALL patients who were referred from different hematology centers in Iraq to the Flowcytometry Department in the bone marrow transplantation center at the Private Nursing Home Hospital/Medical City Center from the January 1, 2016, to the August 31, 2016, all the patients who were referred to the department in that period and have valid flow cytometric immunophenotyping results were included in the study except those with deficient clinical or laboratory data were excluded from the study. Provisional diagnosis as acute leukemia was made by senior hematopathologist and based on bone marrow aspirate and/or peripheral blood examination findings. Either peripheral blood or bone marrow aspirate (according to the abundance of blast cells) was collected within EDTA tubes and processed within first 24 h of collection after a complete blood count (Swelab Alfa coulter, Sweden) and blood film examination (stained by Leishman stain) were done to determine the monoclonal antibodies panel to be used. Immunophenotyping was carried out using 4 colored BD-FACS-Canto II System (Becton Dickenson, USA) where a leukemia panel of fluorochrome-conjugated monoclonal antibodies (Becton Dickenson, USA) were used. Fluorescein isothiocyanate, phycoerythrin, or peridinin chlorophyll protein (PerCP) and Allophycocyanin were used to detect CD1a, CD2, cCD3, CD4, CD5, CD7, CD8, CD10, CD19, CD20, cCD79a, CD13, CD33, CD117, CD11b, cytoplasmic myeloperoxidase, CD14, CD15, CD64 CD34, CD38, human leukocyte antigen-DR (HLA-DR), CD56, and cTdT antigens. Data analysis was performed through BD FACS-CantoII system, using FACS CANTO Diva software (Becton-Dickinson). Blasts gating used dot plots of CD45 expression versus intracellular complexity (side scatter angle, SSC). A threshold of 20% was used to define a positive reaction of blast cells to a given monoclonal antibody, except for MPO, cCD3, CD79a, and TdT, where the threshold was 10%. All results were analyzed and calculated using the Statistical Package for the Social Sciences 20.0 software (IBM corp., NY) and the Microsoft Office Excel software 2007. Pearson Chi-square test, Fisher's exact test, and Student's t-test were used in calculating statistical significance. Only P< 0.05 was considered statistically significant. In the current study, 71 (62%) patients were in pediatric age group (aged <16 years old) whereas 43 (38%) patients were adults (aged >16 years old). In pediatric group, presenting age ranged from 1 to 16 years with a median age of 6 years and a mean age of 7 years while in the adult group, the presenting age ranged between 17 and 86 years with a median age of 29 years and a mean age of 33 years. From the 71 pediatric patients, 35 (49.3%) patients were males and 36 (51.7%) patients were females with a male to female ratio (M:F) of 0.98:1. In the adult group, 28 (65.1%) were males and 15 (34.9%) were females with an M: F ratio of 1.9:1. There was no statistically significant association between age and gender (P = 0.08). 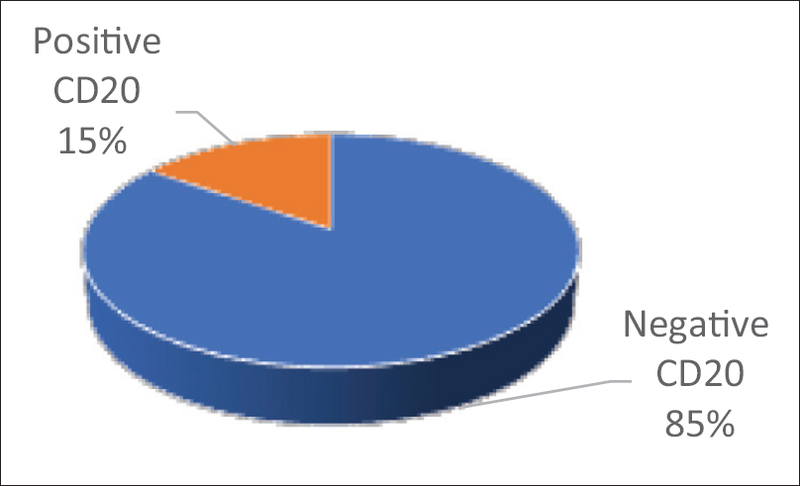 Regarding type of the processed sample, 80 (70%) samples were peripheral whole blood while 34 (30%) samples were bone marrow aspirates. Initial clinical presentation varied among patients; however, fever and pallor were seen often in about three quarters of the patients while organomegaly and lymphadenopathy were observed in almost half of the patients [Figure 1]. There was no statistically significant association between clinical presentation and specific ALL subtype (P > 0.05). Out of 71 pediatric patients, 53 (74.6%) were classified immunophenotypically with B-cell ALL and 18 (25.4%) were classified with T-cell ALL whereas 30 (69.8%) adult patients were classified with B-cell ALL and 13 (30.2%) adult patients were assigned with T-cell ALL. There was no statistically significant association between age and ALL subtype (P = 0.763). In B-cell ALL, pediatric age ranged from 1 to 16 years old with a mean of 5.7 years and a median of 5 years while in adult patients, the age ranged from 17 to 86 years, the mean age was 35.8 years, and the median age was 32.5 years. Regarding T-cell ALL, in pediatric patients the age ranged from 2.4 to 16 years with a mean age of 10.4 years and a median age of 11 years whereas, in adult patients, age ranged from 17 to 37, the mean was 26.5 years, and the median was 26 years. Concerning gender, 38 (46%) patients with B-cell ALL were males and 45 (54%) were females, compared to T-cell ALL, 25 (80.6%) were males and 6 (19.4%) were females. There was a statistically significant association between male gender and T-cell ALL subtype (P = 0.02). White blood cells (WBCs) count was significantly different between genders being higher in males with a mean of 48.480 × 109/L than in females with a mean of 23.073 × 109/L (P = 0.036). In addition, WBCs count was significantly higher in T-cell ALL (mean WBCs was 65.600 × 109/L) when compared to B-cell ALL (mean WBCs was 24.992 × 109/L) (P < 0.01). Flow cytometric immunophenotypic analysis revealed various CD45 expression among ALL subtypes ranging from negative-, dim-, moderate-to-bright expression. B-cell ALL usually express negative-dim-moderate CD45 compared with T-cell ALL which express dim-to-moderate and less often bright but never negative CD45 [Table 1]. Precursor markers CD34 and HLA-DR expressions were associated with B-cell ALL subtype more than with T-cell ALL (P < 0.01) unlike the expression of cTdT and CD38 precursor markers which had no statistically significant association with certain ALL subtype (P > 0.05) [Table 2] and [Figure 2]. In B-cell ALL, B-cell precursor marker CD19 was expressed in all of the 83 (100%) patients, CD10 or common ALL antigen (CALLA) was expressed in 72 (86.7%) of the patients, CD20 expression was found in 32 (38.6%) patients. From the 72 CALLA-positive cases, 47 (88.7%) patients were pediatric and 25 (83.3%) were adults. Positive CALLA expression was statistically associated with positive cTdT expression seen in 64 patients with B-cell ALL (P = 0.04). Eleven (15.3%) patients showed concurrent positive CD10 and CD20 markers [Figure 3]. In T-cell ALL, CD7 marker was the most frequent T-cell marker observed in 30 (97%) patients followed by cCD3 marker which was positive in 25 (80%) patients. Surface CD3, CD4, CD5, CD2, CD8, and CD1a were seen in 21 (68%), 21 (68%), 21 (68%), 18 (58%), 12 (39%), and 6 (9%) patients, respectively. From the 114 cases included in this study, aberrant expression of myeloid markers, CD13, CD33, CD16, and CD 11b, was seen in 19 (22.9%) patients with B-cell ALL and 11 (35.5%) patients with T-cell ALL. Double expression of CD13 and CD33 was seen in 2 patients with B-cell ALL and none in T-cell ALL. 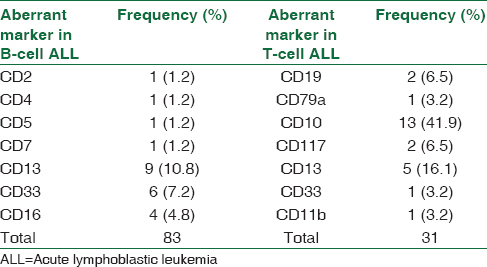 Four patients with B-cell ALL had aberrancy for T lineagemarkers (CD2, CD4, CD5, and CD7) whereas two patients with T-cell ALL showed positivity for CD19, one for CD79a and 13 for CD10 [Table 3]. However, no significant statistical association between aberrant expression with specific ALL subtype except for aberrant CD10 expression in T-cell ALL which was significantly associated with the absence of CD34 and HLA-DR expression (P < 0.01). Immunophenotyping has emerged as a necessary diagnostic implement in disease categorization, outcome prediction, and disease monitoring of leukemias. Immunophenotypic specification of leukemic cells has more than a few purposes; the most important are lineage assigning and minimal disease assessment. From 71 pediatric patients, 49.3% patients were males and 51.7% patients were females which is very parallel to findings of other Iraqi studies,, however, in other studies males dominate.,, Among 43 adult patients, 65.1% were males and 34.9% were females like as seen in other studies ,, but slightly different from that was reported in another study where male gender was reported in 87.5% of adult patients. Such disagreement could be explained by the differences in sample sizes, population variations or due to a factor of chance in collecting cases. In pediatric patients, median and average ages at presentation were to somewhat similar to what was reported in an Iraqi study. Similarly, in adult patients, the median and average ages at presentation were not so different from what was documented in other researches. Age is related to various prognoses in ALL because it is somewhat associated with miscellaneous distribution of significant prognostic subgroups between age groups. In current study and both age groups, more than 2/3 of the cases were classified immunophenotypically as B-cell ALL and the rest as T-cell ALL and this is very comparable to findings of many studies.,, In B-ALL, heterogeneous expression of CD45 was observed starting from negative dim to moderate expression. In B-cell ALL, the low expression of CD45 are associated with more favorable prognosis than in cases with high expression as the intensity of expression may be correlated with specific chromosome anomalies.,, There was a high statistical association between B-cell ALL subtype with positive expression of CD34 and HLA-DR as they were observed in 74.7% and 100% of these patients, respectively, which agrees with other studies in which the expression of CD34 has been reported in 67%–80% of the cases. In pediatric cases, the presence of CD34 is related to the presence of peculiar chromosomal abnormalities and has a good prognostic value. Whereas in T-cell ALL patients, CD34 was expressed in 29% of them, similarly to a group of 300 patients affected by T lymphoblastic leukemia where only third of them demonstrated positivity for CD34. According to some authors, in neoplastic diseases of T-cell precursors, the expression of CD34 has no prognostic value. In the current study, a clear statistical association between B-cell ALL and positive CD10 expression (CALLA) was observed in 86.7% of the patients similar to other Iraqi and Indonesian studies., The expression of CD10 has been reported in the majority of cases with B lymphoblastic leukemia (B-ALL) and precisely on the cells of pre-B and common subtypes suggesting correlation with specific chromosomal abnormalities. The absence of CD10 expression is correlated with a lower frequency of complete remissions and a shorter global survival.,, According to some authors, in T lymphoblastic leukemia (T-ALL) CD10 expression has no prognostic significance, but according to others, its absence is independently associated with an adverse prognosis., CD20-positive expression was found in 15% of CALLA + ve B-cell ALL, in return CD20 antigen presence and intensity of expression are both correlated with a poor prognosis, but the introduction of treatment with anti-CD20 may be able to modify this association., All the cases with B-ALL subtype expressed HLA-DR which is very similar to findings of other researchers., B lymphoblastic leukemia (B-ALL) blasts express HLA-DR at higher intensity compared to AML blasts. Although cytoplasmic TdT is not a lineage-specific marker, it is associated with ALL more than with AML and has been observed in both B-cell ALL and T-cell ALL subtypes as has shown in the current study and other studies. T-cell ALL cases have association with male gender, older age, high WBC count and with dim-moderate (rarely bright) CD45 very comparable to many studies.,,,,, Typically, T-ALL occurs at an older age and more in male than in B-ALL. The WBC is high in T-ALL in comparison with B-ALL as the BM function is often better preserved in T-ALL than in B-ALL. The expression of aberrant antigens in ALL is quite common and may be demonstrated as expression of B lineage associated Ags in T-cell ALL, T lineage associated Ags in B-cell ALL and myeloid-associated Ags in both subtypes. In the current study, aberrant myeloid Ag were the most commonly detected aberrant Ags similarly to findings of other studies., Not only the incidence of myeloid Ag expression but also its impact over prognosis, as it may point to some chromosomal or molecular abnormalities, has been a subject of debate for many researches. Immunophenotypic expression of ALL cells among Iraqi patients is to somewhat in accordance with various researches worldwide making immunophenotyping flow cytometry a crucial appliance in diagnosis, classification, risk stratification and minimal residual disease detection in ALL. A larger sample size with cytogenetic and molecular studies are recommended to evaluate the value of immunophenotype profile among Iraqi ALL patients. Hoelzer D, Gökbuget N. Acute lymphoblastic leukemia in adults. In: Degos L, Linch DC, Löwenberg B, editors. Textbook of Malignant Hematology. 2nd ed. Abingdon: Taylor & Francis Group; 2005. p. 832. Wartenberg D, Groves FD, Adelman AS. Acute lymphoblastic leukemia: Epidemiology and Etiology. In: Estey EH, Faderl SH, Kantarjian HM, editors. Hematologic Malignancies: Acute Leukemias. New York: Springer Berlin Heidelberg; 2008. p. 77, 78, 82, 83, 88, 124, 125. Pui CH. Acute lymphoblastic leukemia. In: Lichtman MA, Beutler E, Seligsohn U, Kaushansky K, Kipps TH, editors. Williams Hematology. 8th ed. New York: The McGraw-Hill Companies; 2011. p. 1321-42. Wetzler M, Mrozek K, Bloomfield CD. Molecular Biology, Pathology and Cytogenetics of Acute Lymphoblastic Leukemia. In: Sekeres MA, Kalaycio ME, BolwellB J, editors. Clinical Malignant Hematology. 1st ed. Cleveland: McGraw-Hill Companies; 2007. p. 111. Aziz SA, Sharma SK, Sabah I, Jan MA. Prognostic significance of cell surface phenotype in acute lymphoblastic leukemia. South Asian J Cancer 2015;4:91-4. Chiaretti S, Zini G, Bassan R. Diagnosis and sub classification of acute lymphoblastic leukemia. Mediterr J Hematology Infect Dis 2014;6:4. Tong H, Zhang J, Lu C, Liu Z, Zheng Y. Immunophenotypic, cytogenetic and clinical features of 113 acute lymphoblastic leukaemia patients in China. Ann Acad Med Singapore 2010;39:49-53. Kadhom AE, Abdul-Majeed BA, AL-Hadad SA, Day PJ. Expression of TEL-AML1 and E2A-PBX1 by real-time PCR in pediatric ALL in Baghdad. Int J Adv Res 2015;3;820-6. Mohammad TK, Mahmood AH, Elew GF, Al-Khalidi SJ. A study on the prevalence of acute leukemia among a group of Iraqi patients. J Al Nahrain Univ 2009;2:107-12. Sudhakar N, Rajalekshmy KR, Rajkumar T, Nancy KN. RT-PCR and real-time PCR analysis of E2A-PBX1, TEL-AML1, mBCR-ABL and MLL-AF4 fusion gene transcripts in de novo B-lineage acute lymphoblastic leukaemia patients in South India. J Genet 2011;90:349-53. Abbasi S, Maleha F, Shobaki M. Acute lymphoblastic leukemia experience: Epidemiology and outcome of two different regimens. Mediterr J Hematol Infect Dis 2013;5:e2013024. Naeem S. Immunophenotypes in acute lymphoblastic leukemia; Association with demographic profile and clinical presentation. Int J Pathol 2014;12:24-9. Al-Bayaa IM, Al-Nidawy ZN, Al-Amiri YA, Hajem IM. Immunophenotyic profile of adult acute lymphoblastic leukaemia in Iraq, a one year experience. Iraqi J Cancer Med Genet 2015;8:164-9. Wang CC, Zhou CL, Wang HJ, Li QH, Liu XP, Gong BF, et al. Probe of classification of adult acute lymphoblastic leukemia. Zhonghua Xue Ye Xue Za Zhi 2011;32:439-44. Chiaretti S, Vitale A, Cazzaniga G, Orlando SM, Silvestri D, Fazi P, et al. Clinico-biological features of 5202 patients with acute lymphoblastic leukemia enrolled in the Italian AIEOP and GIMEMA protocols and stratified in age cohorts. Haematologica 2013;98:1702-10. Möricke A, Zimmermann M, Reiter A, Gadner H, Odenwald E, Harbott J, et al. Prognostic impact of age in children and adolescents with acute lymphoblastic leukemia: Data from the trials ALL-BFM 86, 90, and 95. Klin Padiatr 2005;217:310-20. Haddad F, Wraikat A, Khasawneh R, Kamal N. Immunophenotypic diagnosis of acute lymphoblastic leukemia using flow cytometry; Experience at king hussein medical center. J R Med Serv 2014;21:21-6. Lima M, Almeida J, Dos Anjos Teixeira M, Alguero Md Mdel C, Santos AH, Balanzategui A, et al. TCRalphabeta+/CD4+large granular lymphocytosis: A new clonal T-cell lymphoproliferative disorder. Am J Pathol 2003;163:763-71. Nakamura A, Tsurusawa M, Kato A, Taga T, Hatae Y, Miyake M, et al. Prognostic impact of CD45 antigen expression in high-risk, childhood B-cell precursor acute lymphoblastic leukemia. Leuk Lymphoma 2001;42:393-8. De Zen L, Orfao A, Cazzaniga G, Masiero L, Cocito MG, Spinelli M, et al. Quantitative multiparametric immunophenotyping in acute lymphoblastic leukemia: Correlation with specific genotype. I. ETV6/AML1 ALLs identification. Leukemia 2000;14:1225-31. Thalhammer-Scherrer R, Mitterbauer G, Simonitsch I, Jaeger U, Lechner K, Schneider B, et al. The immunophenotype of 325 adult acute leukemias: Relationship to morphologic and molecular classification and proposal for a minimal screening program highly predictive for lineage discrimination. Am J Clin Pathol 2002;117:380-9. Basso G, Lanza F, Orfao A, Moretti S, Castoldi G. Clinical and biological significance of CD34 expression in acute leukemia. J Biol Regul Homeost Agents 2001;15:68-78. Asnafi V, Beldjord K, Boulanger E, Comba B, Le Tutour P, Estienne MH, et al. Analysis of TCR, pT alpha, and RAG-1 in T-acute lymphoblastic leukemias improves understanding of early human T-lymphoid lineage commitment. Blood 2003;101:2693-703. Suprivadil E, Veerman AJ, Sutaryo L, Purwanto I, vdVen PM, Cloos J. Detection of CD10, CD34 and their combined expression on childhood acute lymphoblastic leukemia and the association with clinical outcome in Indonesia. J Cancer Ther Res 2012;1:1-20. Gleissner B, Goekbuget N, Rieder H, Arnold R, Schwartz S, Diedrich H, et al. CD10-Pre-B acute lymphoblastic leukemia (ALL) is a distinct high-risk subgroup of adult ALL associated with a high frequency of MLL aberrations: Results of the German multicenter trials for adult ALL (GMALL). Blood 2005;106:4054-6. Willemze R, Jaffe ES, Burg G, Cerroni L, Berti E, Swerdlow SH, et al. WHO-EORTC classification for cutaneous lymphomas. Blood 2005;105:3768-85. Glasová M, Koníková E, Stasáková J, Babusíková O. The relationship of HLA-DR, CD38 and CD71 markers to activation, proliferation and differentiation of some human leukemia and lymphoma cells. Neoplasma 1998;45:88-95. Pervez S, Khurshid M. Classification and immunophenotyping of acute leukemias: A prospective study. J Pak Med Assoc 1997;47:103-6. Khatun H, Morshed M, Anam S. Induction in adult acute lymphoblastic leukemia: A study of 22 cases. J Bangladesh Coll Physicians Surg 2015;33:18-22. Abid BF, Al-Mudallel SS. Evaluation of Oncogenic Fusion Transcripts [t (12;21)/TEL-AML1, t(1;19)/MLL-AF4 and t(9;22)/BCR-ABL] in Children with B-acute Lymphoblastic Leukemia by Multiplex PCR Analysis [PhD thesis]. Baghdad: Al-Nahrain University; 2013. Bain BJ, editor. Leukemia Diagnosis. 4th ed. Chichester: Blackwell Publishing; 2010. p. 192. Czuczman MS, Dodge RK, Stewart CC, Frankel SR, Davey FR, Powell BL, et al. Value of immunophenotype in intensively treated adult acute lymphoblastic leukemia: Cancer and leukemia group B study 8364. Blood 1999;93:3931-9. Gupta R, Jain P, Deo SV, Sharma A. Flow cytometric analysis of CD5+B cells: A frame of reference for minimal residual disease analysis in chronic lymphocytic leukemia. Am J Clin Pathol 2004;121:368-72.